If you go to a Whole Foods Market- like pretty much any other market – you’ll see aisles of packaged fruit and vegetables, but 1 particular product had people up in arms on social media last week. People complained so hard about that particular product that Whole Foods ended up pulling it from shelves. The photo has been favorited and retweeted hundreds of thousands of times. Consumers were miffed at Whole Foods last year, too, when the company started selling its Asparagus Water – literally just water with a few stalks of asparagus in it – for $6 a pop. And like the Sumo tangerines packaged in earth-destroying plastic, the company nixed that product, too. But some people are now pointing their anger at Gordon rather than at Whole foods, arguing that the pre-peeled oranges were helpful to the elderly and people with disabilities. From the looks of it, just as many people are ticked off about Whole Foods pulling the peeled oranges from store shelves as there were people who were ticked off about them being there in the first place. 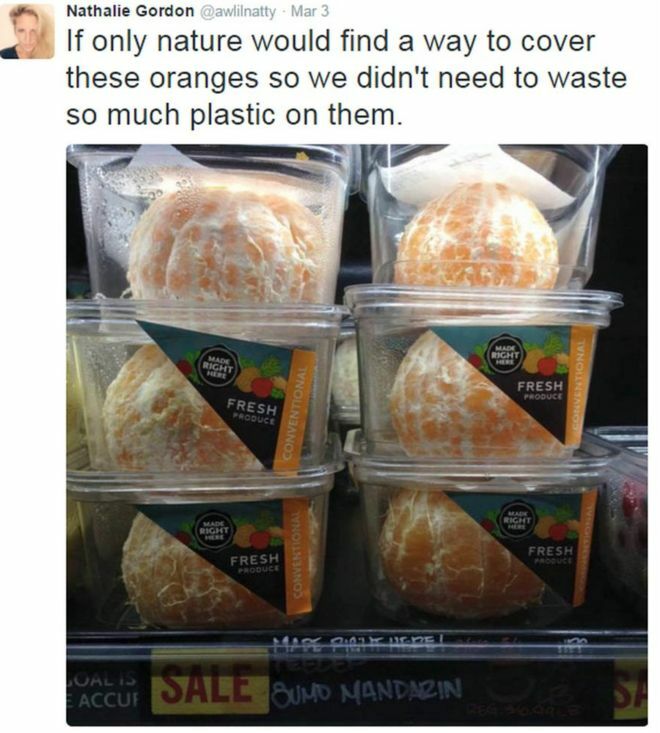 Why the oranges caused a ruckus and not other packaged produce is anyone’s guess because, when you think about it, all fruit comes enrobed in its own natural “packaging” and Whole Foods sells other produce packaged in plastic – including sliced oranges. What, people can’t slice their own watermelon or cantaloupe? It just goes to show the power of an image, and a little well-placed sarcasm.